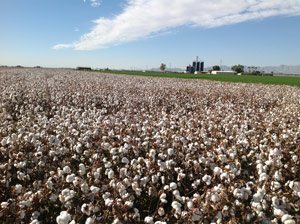 With input costs a major concern across the cotton belt, growers with cost savings innovations are getting ready to be asked lots of questions from their neighbors. 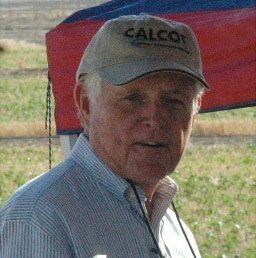 One such grower is Ron Rayner of Goodyear, Arizona, who proactively shares his innovations at an annual field day to review the latest in no-till, double-crop durum wheat-cotton-alfalfa production on a family farm with his two brothers and two nephews. Ron uses his soils expertise and fast turnaround from harvest to planting to maximize revenue and minimize cost on 5,000 acres in this high heat Arizona desert. No-till has been hugely successful on short-season hilly fields, such as rain-fed West Tennessee Loess (wind deposited soils,) at protecting the soil surface from run off and compaction. Double-cropping has been hugely successful in long-season high-rainfall areas, such as South Louisiana and South Georgia, where adequate warmth and moisture is guaranteed year round. So putting the two together in irrigated desert agriculture is not the obvious solution to a profitability squeeze, but has worked well for Ron for over 10 years. The two practices complement each other to keep crops growing all 365 days since Ron doesn’t have to wait on primary or seedbed tillage, or a planting rain, or a crop to dry after a harvest rain. 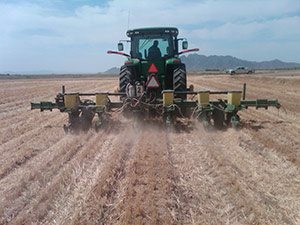 No-till allows planting 2-3 days after harvest since the harvested field is also the seedbed. Irrigation allows precise crop scheduling: of germination by watering up behind the planter, and of crop maturity by timing the last irrigation (and plenty of Pix) to shut the crop down on schedule. Making this all work requires a clear understanding of the soil surface. A lot happens at the surface with flood irrigation: water goes in, seeds germinate and salts and fertilizer accumulate. No-till forces the plant residue and organic matter to accumulate at the soil surface which is just where Ron wants it to prevent crusting and allow water infiltration and soil cooling. Just below the surface two inches, organic matter does not derive from leaves and stems but from dead roots that create pores for movement of oxygen and moisture deeper into the soil – good things for high transpiration desert crops. A general rule in irrigated agriculture is that the more the crop transpires (evaporates water from the leaves) the higher the yield. Ron pays special attention to the soil surface, knowing its critical role and having watched soil tilth (friability) improve over the years. He tracks the surface chemistry and adjusts the pH with sulfur to counter any negative effects of sodium salts on soil tilth. Sodium weakens the attraction of small soil particles destroying tilth, and needs to be displaced from the soil surface by calcium. Elemental sulfur is the low cost route to soluble calcium in high-lime desert soils since sulfur slowly oxidizes to sulfuric acid which dissolves lime freeing up calcium. It’s lots of chemistry but much depends on this thin slice of soil surface.